Simultaneous occurrence of hypohyperdontia is rare, with a prevalence ranging from 0.002% to 0.7%. Varela et al. 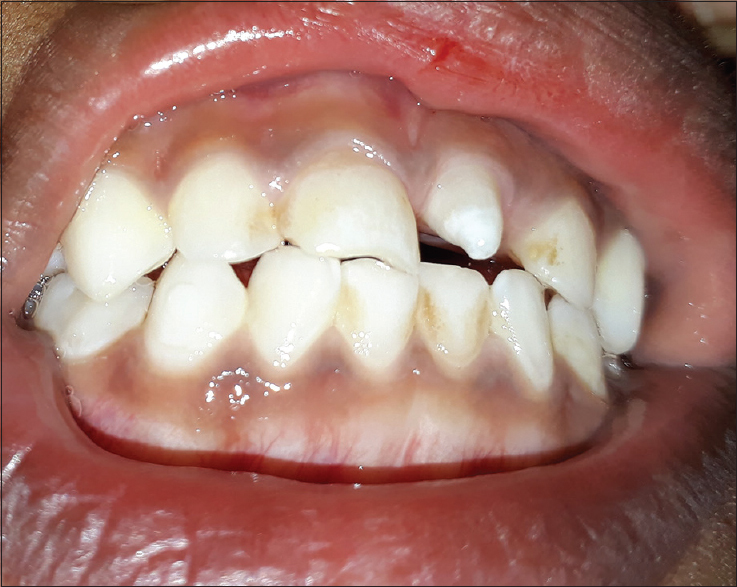 reported concomitant hypohyperdontia (CHH) in seven patients (0.33%) in a sample of 2108 orthodontic patients with a slight male predominance (4:3). In 1979, Gibson presented 20 patients with nonsyndromic hypohyperdontia. More recently, Wang et al. reported 21 patients with CHH. They observed a gender ratio of 2:1 in favor of males. A review of the current literature indicates that this condition most frequently occurs in the premaxillary region, and the anomaly is more common in the permanent and mixed dentition. Till date, very few cases were documented in the primary dentition. The objective of this article reports a rare case of nonsyndromic CHH in a nonsyndromic 5-year-old boy. A 5-year-old boy reported to the Department of Pedodontics and Preventive Dentistry for a routine dental checkup. His medical and family histories were not significant. General examination of the patient did not reveal any abnormality. On intraoral examination, the patient showed a conical mesiodens in place of the primary left maxillary central incisor [Figure 1]. The left primary central incisor was not visible clinically as well as radiologically. 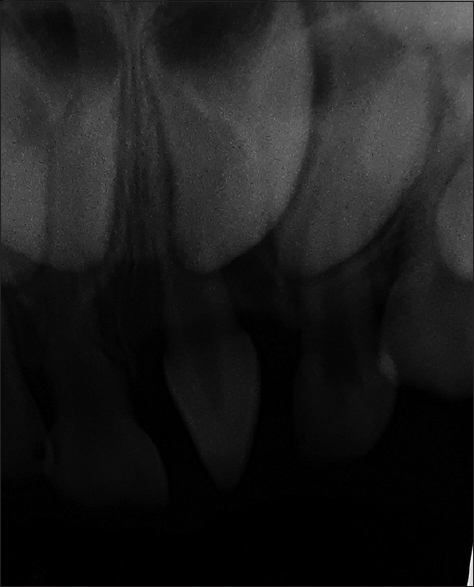 The periapical radiograph showed both the permanent central incisor tooth buds [Figure 2]. All other primary teeth were present. On examination, the left primary maxillary first molar was found to be carious. The mandibular arch was well aligned. The patient's oral hygiene was fair. On subsequent visit, the carious primary maxillary first molar was restored. The patient was advised for a periodic checkup. The etiology of CHH teeth remains speculative. The occurrence of this numeric anomaly in twins and in syndromic patients is suggestive of genetic factors playing an important role in its development. The most accepted theory of supernumerary teeth formation is hyperactivity of dental lamina. In addition, genetic theory, atavism, environmental factors, and phylogenetic theories are also put forward to explain the occurrence of this anomaly. Similarly, the interaction of genetic and environmental factors plays an important role in the development of hypodontia. Mutations in the MSX1, TGFA, and PAX9 genes are believed to be responsible for familial hypodontia. The condition has been reported with various syndromes such as cleft palate, Down's syndrome, Ellis–van Creveld syndrome, Dubowitz syndrome, and Duchenne muscular dystrophy., The present case of premaxillary CHH was, however, not associated with any syndrome. The condition appears to have shown no gender predilection, although several researchers have observed a male dominance. Hypodontia is more common in females whereas primary supernumeraries appear to have no genetic predilection. In the present case, CHH was observed in a male patient. The condition may occur in the same region of a dental arch or in different regions of the same arch and in some cases involve both the maxilla and mandible. Gibson classified the condition into four types as follows: premaxillary, maxillary, mandibular, and bimaxillary hypohyperdontia. A review of the literature suggests that in 65% of cases, CHH involve both the jaws. The second most common type is maxillary CHH accounting for 21% of cases. A recent study by Wang et al. found bimaxillary hypohyperdontia in about three-fourths of the cases. The majority of cases of CHH show agenesis of the mandibular second premolar or maxillary lateral incisor. These two teeth are the most commonly missing teeth in human dentition. Similarly, mesiodens, the most frequently observed supernumerary in CHH, correlates with the most common supernumerary tooth. Anomalies in the primary dentition are often associated with the anomalies in the permanent dentition. In the present case, however, radiographic examination ruled out the presence of any numerical anomalies in the succedaneous teeth. In this article, a mesiodens was observed in conjunction with a missing maxillary central incisor. The primary right maxillary central incisor was normal in size and shape. However, its contralateral primary maxillary central incisor was missing. Instead, a tooth conical in shape and bearing no resemblance with the adjacent tooth was seen. Therefore, the tooth is probably not a central incisor, but a conical mesiodens erupted in the available space of primary left maxillary central incisor. The management of CHH is challenging, and since very few cases were reported in the literature, it is largely individualized. Supernumerary teeth are often indicated for extraction when they present unsightly appearance or associated with complications. The supernumerary tooth was asymptomatic, and the parents did not bother about the appearance of the patient's front tooth. To avoid psychological trauma associated with tooth extraction and to maintain the surrounding alveolar bone, it was decided to retain the mesiodens. Zhu JF, Marcushamer M, King DL, Henry RJ. Supernumerary and congenitally absent teeth: A literature review. J Clin Pediatr Dent 1996;20:87-95. Ranta R. Numeric anomalies of teeth in concomitant hypodontia and hyperdontia. J Craniofac Genet Dev Biol 1988;8:245-51. Wang YL, Pan HH, Chang HH, Huang GF. Concomitant hypo-hyperdontia: A rare entity. J Dent Sci 2018;13:60-7.